The rule of law is a delicate thing. If some individuals have more access to the justice system than others – say, the wealthy more than the indigent – faith in the entire institution falters. Hala Sandridge articulates this eloquently in a column for the Tampa Bay Tribune, where she addresses post-hurricane legal needs and the importance of pro bono service. Helping people hold on to their homes stabilizes families and property values. Helping them overcome obstacles to employment affords them the ability to continue as a contributing member of society. Helping them rebuild their lives makes the whole community stronger…. So pro bono work is not just good for the client and it’s not just good for the soul, it’s also good for society. Her words reflect the reasons most attorneys go into this profession – justice, advocating for the underdog, good government or something along those lines. And though attorneys generally follow through in their careers and do the right thing, too often it goes unnoticed. That’s one reason we at Esquire decided to look into pro bono service. The other reason is our own commitment to equal access to legal representation. That’s pretty good, in my opinion, and more than a lot of Americans might expect. 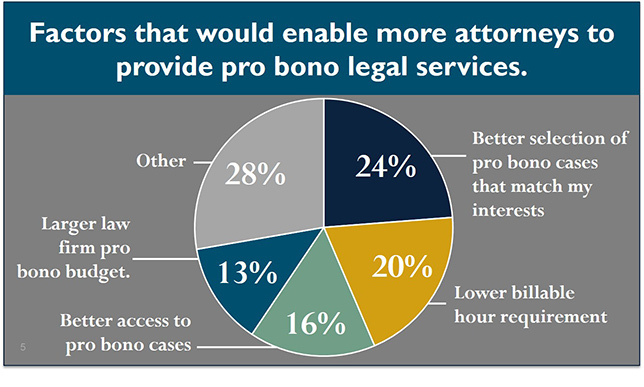 So why did attorneys do so much pro bono? For younger attorneys, however, litigation experience was an important reason for doing pro bono. It was cited by 1 in 4 attorneys with 1 to 4 years of experience. The American Bar Association’s Model Rule 6.1 says every lawyer has a professional responsibility to provide legal services to those unable to pay and should aspire to do at least (50) hours of pro bono work per year. Nonetheless, only 35 percent of Esquire survey respondents said their firm supports and reinforces the ABA standard. Forty-three (43) percent indicated their firm doesn’t support the standard, and 22 percent don’t know if the firm does or doesn’t. Bigger firms are more likely to support the ABA standard. Sixty-four (64) percent of respondents in firms of 500 or more attorneys said their firm supports and reinforces the ABA standard. Support was still fairly strong in the smallest firms – those with one to five lawyers – at 46 percent. The figures were lower for firms in the middle ranges. Twenty-six (26) percent of those who chose Other suggested that a more encouraging firm culture could enable more attorneys at their workplace to provide pro bono services. Twenty-two (22) percent of those who chose Other suggested providing credit for pro bono work toward billable hours or continuing legal education (CLE) requirements. 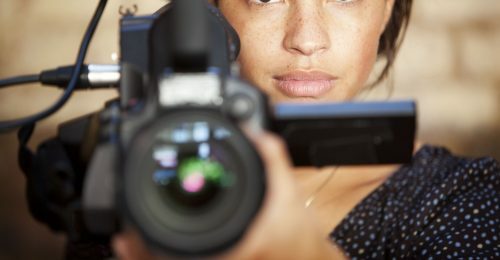 Individual attorneys are very dedicated to providing pro bono legal services, but firms could do a lot more to support this work: ensure every lawyer fully participates; offer credits for the hours served; provide a clear encouraging message from those who shape the culture; and offer cases that match attorneys’ interests. Case matching is getting easier. Sandridge describes an innovative website that helps Florida attorneys find clients who need their expertise. Nice idea. 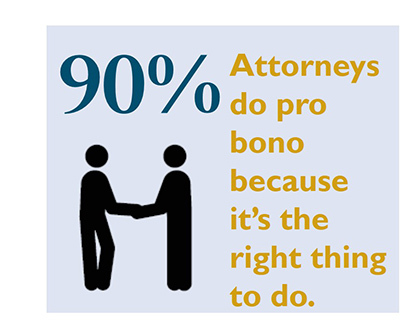 Ultimately, as the data suggests, to improve the profession’s already robust pro bono performance, every attorney should clearly understand there’s a bedrock firm-wide commitment to do the right thing.